Physicist . . . Nobel winner . . . bestselling author . . . safe-cracker. 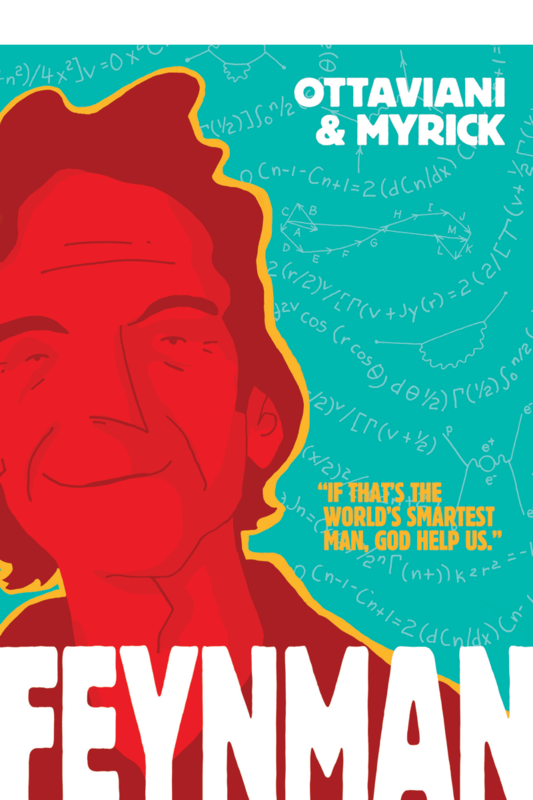 Feynman tells the story of a great man’s life, from his childhood in Long Island to his work on the Manhattan Project and the Challenger disaster. You’ll see him help build the first atomic bomb, give a lecture to Einstein, become a safecracker, try not to win a Nobel Prize (but do it anyway), fall in love, learn how to become an artist, and discover the world. Anyone who ever wanted to know more about quantum electrodynamics, the fine art of the bongo drums, the outrageously obscure nation of Tuva, or the development and popularization of physics in the United States need look no further! Feynman explores a wonderful life, lived to the fullest. About the storytellers: Cartoonist Leland Myrick is the Ignatz Award- and Harvey Award-nominated author and illustrator of The Sweet Collection , School Girls , Bright Elegy , and Missouri Boy . His writing and illustrations have appeared in publications as diverse as Dark Horse Comics, GQ Japan, Vogue Russia, Flight, and First Second Books. He lives in Pasadena, California. Want to know what we read and consulted when creating the book…so you can read more yourself? Then download the full bibliography! (1) D.W. points out that we have an anachronism in the last twopanels of page 151: “In the right panel in the middle row, there’s theheading ‘Caltech (1952)’ with Feynman walking in front of the stairwayinto Lauritsen Laboratory, where his office later was. However,Lauritsen wasn’t built until 1969; I’m not sure what was there atthat time, though. More seriously, though, in the bottom panel on thepage, Feynman is walking in front of the Beckman Institute, which wasbuilt in 1989…” Clearly I screwed up in providing Leland reference on this, so thanks for the correction. stored in a closet across the hall from Feynman’s old office in 2008, found a letter on Caltech stationary typed by his secretary, worded somewhat differently from the telegram described in “What Do You Care what Other People Think?” . That letter is now in the Caltech Archives, for you to discover. Following up, here’s what he had to say: “Feynman’s introduction of what he calls ‘the rule for successive amplitudes’ starts at around minute 63 on the Vega Science Trust tape of his Robb Memorial Lectures, Part 2. (I am not sure if he discusses it again elsewhere.) The paraphrased quotation in Feynman , ‘If a path is a succession of interactions, to get the amplitude of the whole path you multiply the amplitudes instead of adding,’ might come from minute 67:43, where Feynman says, ‘This is the rule of composition: Add the angles and multiply the lengths. So if you have two events in succession you combine them by this rule of composition, that you add the angles and multiply the lengths.’ However, this was not followed by a discussion of shooting craps, or joint probabilities, so it appears you may have added that part. I would like to suggest the following correction: Change the original to ‘If you’re shooting craps, the probability of rolling a one on either die is 1/6, so the probability of rolling snake eyes is 1/6 x 1/6 = 1/36.'”. To which I say… Thank you! Shorter and more accurate is always better. The paperback edition was already at the printer, so this correction won’t appear in the next printed version. But I’m grateful for the clear explanation and correction! (4) The Hoyle interview referenced in the bibliography area has moved since the first edition came out. It’s now at CosmoLearning: “Richard Feynman: Take the world from another point of view (1973)”. Go watch; it’s great. anachronism that crept into it on page 26 when he’s explaining the aurora to his little sister, Joan. This was about the mid-30s and he tells her ‘it’s the solar wind, which accelerates electrons through the magnetosphere.’ He’s got his facts right, and the concepts were sort of known at the time, but the two terms “solar wind” and “magnetosphere” were not invented until the late 1950s. It’s hard to figure out sometimes what exactly people understood at given time so I dug out one of the classics from that era, “Geomagnetism” by Sidney Chapman and Julies Bartels. It was first published by Oxford Press in 1940 and our reading room has a republished edition from 1962 where they did some corrections but didn’t do any updating. So about 1935-1940 there was the “corpuscular theory” that there were hot charged particles (type unknown) coming off the sun and creating the corona. There was also some understanding that there was a connection between the solar cycle with the larger number of flares during the solar maximum and the number and intensities of auroral displays. But it wasn’t universally accepted that these “corpuscles” reached the Earth. Some were arguing that the ultraviolet light from the sun was variable and that was what was energizing the upper atmosphere particles and causing the aurora. But some were speculating about what would happen if these charged particles reached the Earth and how they would interact with the Earth’s magnetic field, and their early drawings look very much like our current picture of the magnetosphere. So reading over Chapman’s book is like seeing a jigsaw puzzle on a table. You can see that all the key pieces are lying there, but no one has the understanding yet to put them together completely. So if I were having to put words into the 1935 Feynman, I’d have him saying something like ‘Scientists think it’s electrically charged particles coming from the sun and being deflected by the Earth’s magnetic field towards the magnetic poles.’ Same idea, just using the contemporary words. “As for the terms, “solar wind” was coined by Eugene Parker in a paper in 1958 when he put several of the ideas that were already out there in Chapman’s book and other places and realized that there must be a continuous flow of charged particles from the sun. Meanwhile the term magnetosphere was coined by Thomas Gold in 1959 to explain the region of space where the early satellites were seeing ions and electrons that were trapped on the Earth’s magnetic field lines. Part of the upcoming Cindi comic book actually explains the origin of the term as you can see in the attached picture. Good points, and good stories! Thanks Marc. And you can check out his comics work at CINDI Education. (6) Thanks to reader C.D.’s question, here’s an update on page 57: The story of Richard giving Joan an astronomy textbook is a little bit factual, a little bit fictional. There is indeed a book titled “The Solar System” by Henry Norris Russell, and if you follow that link you’ll see that Leland drew a version of its title page. (If you squint, you can see that he reproduced the text with great fidelity…it may not have been the best idea for me to ask him to be so faithful, since that detail made it confusing to C.D..) When looking into this further, I find that there’s a newly available interview of Joan Feynman that says the actual book her brother gave her was “Astronomy” by Robert Horace Baker. I recommend reading the whole thing at Finding Ada. So why did I pick the book I did? I can’t find the email exchange right now, but as I recall when I wrote to Dr. (Joan) Feynman a number of years ago, she replied that she didn’t remember what book it was, so I picked something that was plausible. Perhaps in the intervening years she ran across the volume on her shelf — I’m sure she kept that important gift! — or simply remembered the title, and that’s why the interview linked to above names a different book. (7) Professor Leonard Finegold noted a mistake on page 168, asking “Is the wiggly line [under the electromagnetic spectrum] backwards?” The answer is yes, and I’m surprised nobody (including me) noticed it before. I remember some discussion about this panel, and can’t remember what it was about…but it wasn’t this! First Second is great about these things, so we plan to get this fixed in the next printing. (We hope to address Mike’s concern and incorporate his suggestion from (3) above at the same time.) Thanks, Len! … and also Alexander Phillips, who contacted us about the same thing just a few days later. And this after almost 5 years of the book being in print; Feynman would have something to say about the odds against that happening!